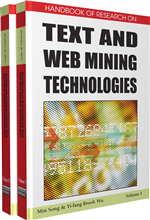 This chapter presents background on text mining, and comparisons and summaries of seven selected software for text mining. The text mining software selected for discussion and comparison in this chapter are: Compare Suite by AKS-Labs, SAS Text Miner, Megaputer Text Analyst, Visual Text by Text Analysis International, Inc. (TextAI), Magaputer PolyAnalyst, WordStat by Provalis Research, and SPSS Clementine. This chapter not only discusses unique features of these text mining software packages but also compares the features offered by each in the following key steps in analyzing unstructured qualitative data: data preparation, data analysis, and result reporting. A brief discussion of Web mining and its software are also presented, as well as conclusions and future trends. Hearst (2003) defines text mining (TM) as “the discovery of new, previously unknown information, by automatically extracting information from different written sources.” Simply put, text mining is the discovery of useful and previously unknown “gems” of information from textual document repositories. Also Hearst (2003) distinguishes text mining from data mining by noting that with “text mining the patterns are extracted from natural language rather than from structured database of facts.” A more technical definition of text mining is given by Woodfield (2004) author of SAS Notes for Text Miner, as a process that employs a set of algorithms for converting unstructured text into structured data objects and the quantitative methods used to analyze these data objects. Text mining (TM) or text data mining (TDM) has been discussed by numerous investigators that include Hearst (1999), Cerrito (2003) for the application to coded information, Hayes et al. (2005) for software engineering, Leon (2007) for identifying drug, compound, and disease literature, and McCallum (1998) for statistical language modeling. Firestone (2005) emphasizes the importance of text mining in the future knowledge work. Romero and Ventura (2007) survey text mining applications in the educational setting. Kloptchenko et al. (2004) use data and text mining techniques for analyzing financial reports. Mack et al. (2004) describe the value of text analysis in biomedical research for life science. Baker and Witte (2006) discuss the mutation mining to support activities of protein engineers. Uramoto et al (2004 ) utilized a text-mining system adopted from that developed by IBM and named TAKMI (Text Analysis and Knowledge Mining) for use with very large text biomedical text documents. In fact the extension of TAKMI was named MedTAKMI and was capable of mining the entire MEDLINE of 11 million biomedical journal abstracts. The TAKMI system allows extracting deeper relationships among biomedical concepts by the use of natural language techniques. Scherf et al. (2005) discuss the applications of text mining in literature search to improve accuracy and relevance. Kostoff et al. (2001) combine data mining and citation mining to identify user community, and its characteristics by categorizing articles. Compare Suite: AKS Labs software that compares texts by keywords, highlights common and unique keywords. Megaputer TextAnalyst: Software that offers semantic analysis of free-form texts, summarization, clustering, navigation, and natural language retrieval.